Church Basement Press: NAMI - Defying Mental Illness "provides just what's needed"
Publisher of DEFYING MENTAL ILLNESS. Church Basement Press publishes books that support the work of faith-based and community organizations and help people make progress in their lives. NAMI - Defying Mental Illness "provides just what's needed"
We were happy to see NAMI's review of our book. Read the full review here. "Defying Mental Illness offers tangible, person-focused strategies that deliver information in a reader friendly manner that takes the initial overwhelming feeling of experiencing a mental illness and helps parse it out into easy to understand categories. " And Dr. Barbara Becker Holstein says our book really takes the sting out of mental illness. Follow Defying Mental Illness on Facebook. Paul Komarek is an author and consultant with a comeback story. After bipolar disorder wiped out his legal career, Paul rebuilt his life around his strengths as a writer, teacher and policy expert. He works on tough social issues, including criminal justice reform, education of children with disabilities, violence prevention, addiction treatment, and health care for the poor. 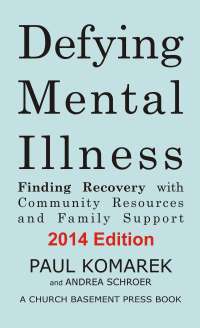 Paul’s book Defying Mental Illness, Finding Recovery with Community Resources and Family Support is the first book for general audiences to focus on mental health recovery, not how to have your disease. He is working on a new blog project called Redesigning Mental Illness that focuses on what ordinary people can do to fundamentally change how mental illness plays out in America. Election disclaimer. Copyright 2011 by Paul Komarek. Picture Window theme. Powered by Blogger.